HP Umpire Todd Tichenor ejected Marlins P David Phelps and Manager Don Mattingly for arguing a ball four call in the bottom of the 8th inning of the Marlins-Dodgers game. With one out and two on, Dodgers batter Joc Pederson took a 3-2 fastball from Phelps for a called fourth ball. Replays indicate the pitch was located off the inner edge of home plate and thigh high (px 1.067, pz 2.681) and that all other pitches during the at bat were properly officiated, the call was correct. 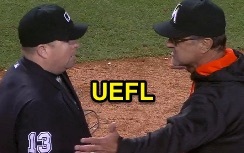 At the time of the ejections, the Marlins were leading, 2-0. The Marlins ultimately won the contest, 2-0. These are Todd Tichenor (13)'s first and second ejections of the 2016 MLB regular season. Todd Tichenor now has 7 points in the UEFL Standings (-1 Previous + 2*[2 MLB + 2 QOCY] = 7). Crew Chief Bill Miller now has 8 points in Crew Division (6 Previous + 2*[1 Correct Call] = 8). These are the 14th and 15th ejections of the 2016 MLB regular season. This is the 8th player ejection of 2016. Prior to ejection, Phelps' line was 0.0 IP, BB. This is the 7th Manager ejection of 2016. This is the Marlins' 2/3rd ejection of 2016, 1st in the NL East (MIA 3; ATL, NYM, PHI, WAS 0). This is Don Mattingly's 2nd ejection of 2016, 1st since April 22 (Brian Gorman; QOC = Y [B/S]). This is David Phelps' first ejection since September 16, 2014 (Rob Drake; QOC = U [Throwing At]). This is Todd Tichenor's first ejection since May 31, 2015 (Jeff Banister; QOC = N [Out/Safe]).